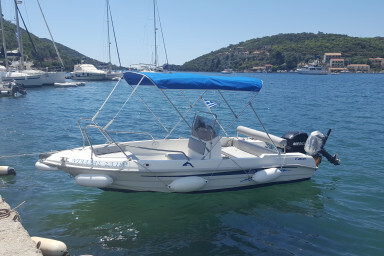 Motorboat with Mercury 30/40 hp, power trim, electric starter, steering wheel, Gps-plotter, depth counter, cruising bimini, swimming ladder, cushioned seats, safety eqp, mobile telephone, second backup outboard engine. 5 people maximum. No speedboat certificate required. Dallas is a Vip 460, very comfortable boat for up to 5 guests. It has a 30/40 hp 4 stroke Mercury outboard which gives a cruising speed of 18 knots and max 25 knots. The engine is of the best outboard engines very economic on fuel, with average whole day consumption 15-23 litters. Mercury 30/40 is the fastest outboard on the category of no driving certificate needed. It is a boosted engine stronger than any other standard 30 hp. On boat there is also a wide bimini to protect you from sun and you may always keep it open while you cruising. All around the boat there are cushioned seats to make your travel even more comfortable. Last there is a Gps-plotter on boat which allows you all the time to know the exact place of the boat, speed and depth. You will never need to worry about where are you and where you heading to. Last boat has a second back up outboard engine Yamaha 3hp. And of course for any case there is a mobile on boat that you may use it any time to contact us.